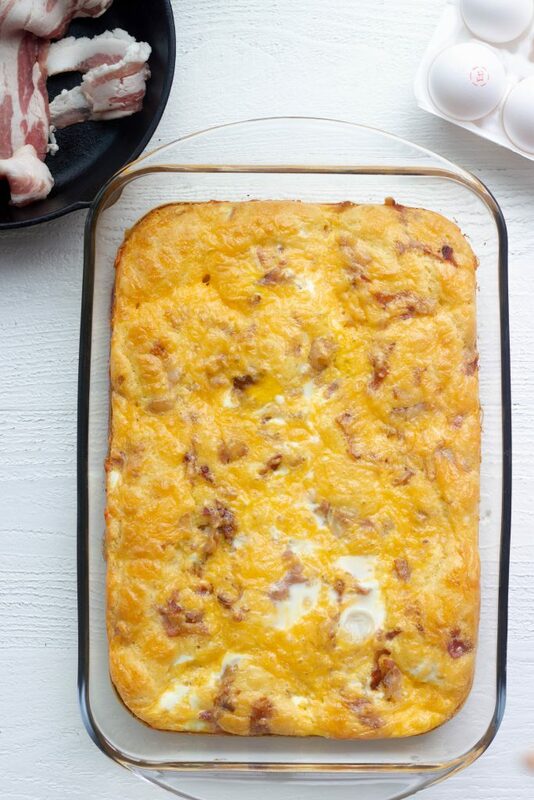 A keto breakfast casserole with bacon, sausage, egg, cheese, and a buttery keto friendly bread. Perfect for meal prep and just 3.5 net carbs per serving! Thank you to the Ohio Pork Council for sponsoring this recipe. All opinions and recipes are my own. Unless you practice intermittent fasting, breakfast time can be stressful! When you wake up starving, the last thing you want to do is have to wait to eat! And when you are ready to break a fast, you want to eat! Like, now! That is why I love keto breakfast recipes that can be prepped ahead of time to be enjoyed through a busy week or weekend! 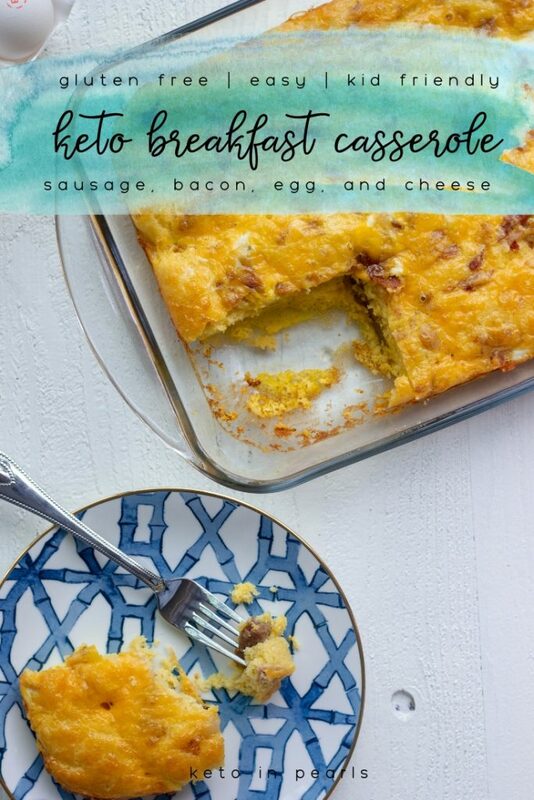 Before we started eating keto, I often made a breakfast casserole that had sausage, egg, cheese, and canned biscuits in it. I’m not gonna lie, it was delicious, but obviously we don’t eat it anymore. But just because we don’t eat it doesn’t mean I don’t miss that meal! In fact, I had a hankering for breakfast casserole the other day and wanted to try my hand at a keto breakfast casserole. Replicating the soft buttery biscuit dough was going to be my challenge in this recipe. A gluten free and low carb biscuit is not easy to recreate. I’m working on it but, like my pancakes, it is taking some time to perfect! But I did have the idea to use my keto cornbread as a swap for the biscuit dough. I was a bit worried about how it would work with the egg but y’all! Oh my lanta it was soooo perfect! I layered the bottom of the casserole with sausage patties cut in half, like a bun. Then I layered cornbread batter, bacon, cheese, and lastly the egg mixture. Similar to the biscuit dough, the cornbread batter spreads and fills in some gaps in the casserole. 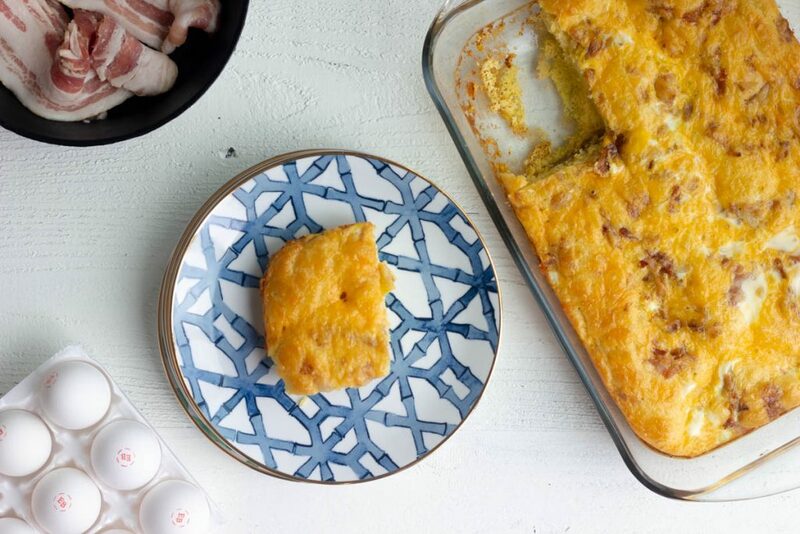 You can’t really go wrong with pork, eggs, and cheese in a breakfast dish! It’s kind of like a keto trifecta! My three year old is a very very picky eater and usually refuses all meat. I know, sometimes I wonder if he’s really mine, haha. But when he saw me shooting the photos for this dish he said “mommy, what’s that smell? !” and proceeded to eat that entire plate of protein! 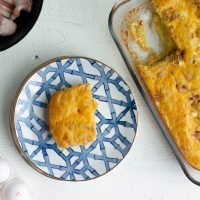 So, if my insanely neurotic threenager devoured a plate of this keto breakfast casserole, then you know it’s good! I always used to fix my old breakfast casserole on Christmas mornings so I’m really excited to have this version this Christmas! 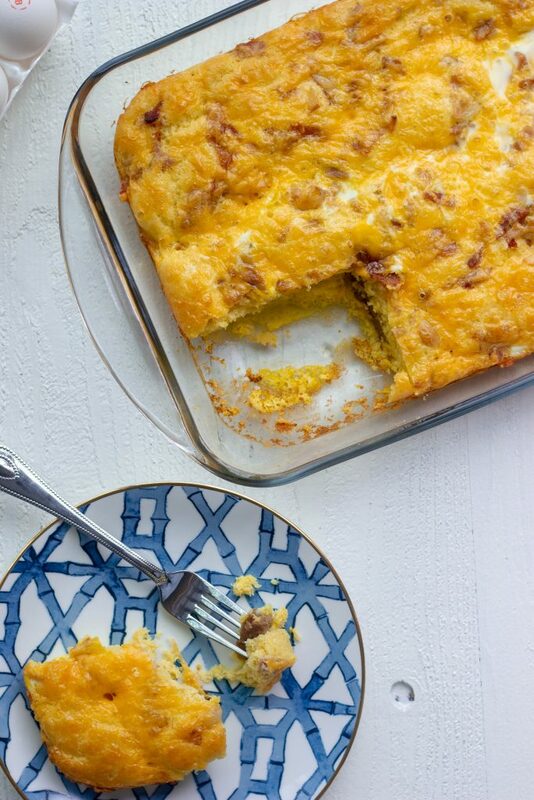 As always, I hope your family loves this keto breakfast casserole as much as we did! Be sure to tag me on social media (@keto_in_pearls) with your recreations! You can also follow Ohio Pork on Instagram, Facebook, and Twitter for more pork recipes and pig farming education! Preheat oven to 350 degrees. Grease a 9x13 baking dish and set aside. In a skillet over medium high heat, fry the sausage patties until done, about 5 to 7 minutes. Remove from the skillet and let cool. Once cool enough to touch, slice in half (like a bagel). Lay the sausage patty halves on the bottom of the casserole dish. In a medium mixing bowl, combine all ingredients for the cornbread and whisk until combined. Use a measuring spoon to place dollops of batter all over the sausage patties. Do not worry about perfection. Sprinkle the bacon crumbles on top of the cornbread layer. Sprinkle the cheese on top of the bacon layer. In a large measuring cup, whisk the eggs and half n half together. Pour evenly over the entire casserole. Bake uncovered for 25 minutes. Let rest 5 minutes before serving. This is an AWESOME recipe. I used a couple of shortcuts to make it even easier: frozen high-quality, pork sausage patties and pre-cooked thick-sliced bacon. The patties were the perfect size and did not need to be sliced. Put them frozen in the casserole as well and baked it 30 min. It came out perfect and sliced beautifully into 8 generous portions. It almost had an “impossible pie” quality with the addition of cornbread batter. I also drizzled on a little sugar-free maple syrup when I served it. Now I’m all set for the week for breakfast. This is a keeper and will be made many times. Thank you. There is nothing more scrumptious than pork sausage AND bacon! Added 2T sweetener to ‘ cornbread ‘ mixture. I like sweet cornbread! Added scallions to top before baking. Topped with a small dollop of sour cream. Half and half is very much keto friendly. Foods are not inherently keto or not keto.In fact, half n half has less calories and fat for the same serving of heavy cream. Heavy cream is not a requirement for a ketogenic diet, though I see how someone could be confused by that as so many people use it. Keto simply means to eat in a way to maintain nutritional ketosis. This recipe is very keto friendly.